HP X4000b Bluetooth Wireless 3-Button Laser Mouse. P/N: H3T51AA. Model: X4000b. Bluetooth Wireless 2.4 GHz. HP X4000 Bluetooth Laser Mouse. Transceiver-free mouse - connects directly to your Bluetooth enabled PC. Combining style and on-the-go comfort, the ergonomically designed, nicely affordable wireless HP optical mouse (model VK479AA) provides uncompromising performance with an adjustable sensitivity (from 1250 to 1750 cpi) for maximum workability on a variety of surfaces. HP X4000b Bluetooth Wireless 3-Button Laser Mouse. HP X4000b Bluetooth Mouse. Model: X4000b. Bluetooth Wireless 2.4 GHz. Transceiver-free mouse - connects directly to your Bluetooth enabled PC. Laser Technology. 2.4GHz Wireless. Up to 16 months battery life . Up to 16 months battery life . 1-year limited warranty. Slim Design. Fast and accurate with 1,200 dpi optical sensors. HP X4000b Bluetooth Wireless 3-Button Laser Scroll Mouse H3T51AA. What will you get?. The mouse has an adjustable palm rest. No other accessories included. HP part number: VK479AA. Combining style and on-the-go comfort, the ergonomically designed, nicely affordable wireless HP optical mouse (model VK479AA) provides uncompromising performance with an adjustable sensitivity (from 1250 to 1750 cpi) for maximum workability on a variety of surfaces. Manufacturer Part#1KF75AA#ABL. Product Type:Mouse. Pointing Device Host Interface:USB. All In Ones. HP 2.4GHz Wireless USB Mouse Z3700 (Black) NEW. It's functional. It's portable. It's fashionable. It's yours. Enjoy the freedom of Radio Frequency wireless connectivity found in most devices. Wireless convenience. With up to 16 months of life on a single AA battery, this mouse was designed to push the limits. Distinctive design with glossy black casing and piercing red LED lights. Mouse feet enhance gliding performance. Flexible connection. Z3700 Wireless Mouse Gold. It's functional. It's portable. It's fashionable. It's yours. Pointing Device Wireless Technology: Radio Frequency. Wireless convenience. Pointing Device Connectivity Technology: Wireless. Installation is easy - plug and play - no software drivers to install. M/N: MSU0923, N910U, MODGUO, PMX-MMODGU0. Wired Connectivity. Interface: Wired USB. Type: USB Optical Mouse. Type: Optical Mouse. Type: Gaming Mouse AVAGO 3050. Model: HP G200. Features: Adjustable DPI. Interface: USB. Color: white. With up to 16 months of life on a single AA battery, HP Z3700 Wireless Mouse was designed to push the limits. Blue LED technology lets your mouse function on a wide range of surfaces, while a sleek design complements your favorite devices. Przeznaczenie: Gaming. Profil: Praworęczny. Zasilanie: USB 5V. Długość przewodu: 2 m. Interfejs: USB. Połączenie: Przewodowe. Kolor: Czarny. HP mouse in great shape. Manufacturer Part Number: A0X35AA#ABA. Product Model: x4000. The high-end design of the HP Wireless Mouse X4000 mimics the motion of a fast sports car. But the fun doesn't stop there. This comfortable mouse also features wireless connectivity, 30-month battery life and a highly-precise laser sensor. BLUETOOTH. 9 MONTH BATTERY LIFE. Z3700 Black Wireless Mouse HP. P/N: V0L79AA#ABL. SKU: HPV0L79AA. MPN: V0L79AA#ABL. It's functional. It's portable. It's fashionable. It's yours. Mysz gamingowa HP z sensorem optycznym o czułości 5000 DPI4PH30AA / UMHPDRPG0000003. Przeznaczenie: Gaming. Wymiary: 4.2 x 12.5 x 6.9 cm. Rozdzielczość (maks.). : 5000 dpi. Profil: Uniwersalny. Zasilanie: USB 5V. Modguo Model. No ball and no cleaning. USB connection plug - so it's Plug and Play compatible. Easy setup : USB connectivity, standard 3-button operation, and no driver or CD installation required for fast and easy plug and play use. And it features a high 1000 dpi optical sensor. No ball and no cleaning. USB connection plug - so it's Plug and Play compatible. Stylish design : High-tech piano black finish and sculpted edges gives this mouse a distinctive style. HP V0L79AA#ABL Mouse - Z3700 Black Wireless Blue LED Wireless Radio Frequency Black USB Desktop Computer, Notebook Scroll Wheel. V0L79AA#ABL HP. P/N:V0L79AA#ABL. MPN: V0L79AA#ABL. Pointing Device Wireless Technology: Radio Frequency. New (Other See Details) Shows That The Item Was Pulled From a New Computer (Laptop / Notebook, Desktop). Used, GRADE A, Genuine, Original. FREE Trial ! Used Grade A This Grading Show That The Item Is In Good Condition For its Age And Will Show Very Minor Signs Of Wear. Victory is a group effort, and bringing the right tools can make you go from average teammate to the team’s backbone. 5.04 x 2.92 x 1.62 in. Windows 7, 8, 10. Manufacturer Part Number H3T51AA#ABC. X4000b Bluetooth Mouse. Product Model X4000b. 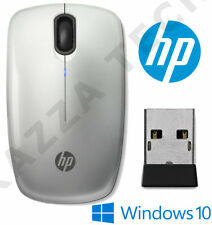 Product Title HP X4000b Bluetooth Mouse (H3T51AA#ABC). Manufacturer PNY Technologies. Marketing Information Be more productive on the go with this sleek, stylish mouse that's comfortable wherever you work best The compact, cordless design fits easily into a carrying case alongside your notebook, tablet or Ultrabook™.